Casa Batlló - the Batllo House in Barcelona is a Modernist building on the street Passeig de Gracia in the Eixample district of Barcelona that was designed by Barcelona's most famous modernist era architect, Antoni Gaudi. This is one of Gaudi's most popular buildings in Barcelona. Casa Batlló is on the elegant shopping boulevard called Passeig de Gracia which is the center of Barcelona's modernist Eixample district. Casa Batlló was built between 1875 and 1877 and bought by Josep Batlló i Casanovas in the year 1900. Batlló commissioned Antoni Gaudi to renovate an existing residential building in the modernist style that was popular at the time. The resulting transformation by Gaudi became timeless and breathtaking. Casa Batlló is open to visit all year and in the summer months from mid-June to end August you can enjoy evening concerts on the terrace. THe original structure of Casa Batlló was not built by Antoni Gaudi. He redesigned the inside and outside of an ordinary apartment building to create the current Casa Batlló. The renovation work lasted two years from 1904 to 1906 Casa Batlló was a transformation that brought Gaudi international fame. The Batlló house is listed as a UNICEF World Heritage site along with several other Gaudi buildings in Barcelona. Two attic floors were added to Casa Batlló during the refurbishment, and a fantasy dragon back roof tower crowns this masterpiece. In the summer you can enjoy concerts on the courtyard terrace. For the facade of Casa Batlló Gaudi designed a splendid rounded front gallery and a multi-coloured glittering surface of fish scale inspired ceramic pieces. Casa Batlló has elegantly rounded balconies that some say look like human skulls - perhaps the bones of victims of the dragon on the roof. The facade of Casa Batlló was 'painted' by Gaudi almost like a giant canvas. The front facade is a trencadis work of art that has been compared to the style in Monet’s water lilies painting. Gaudi stood on the street and shouted directions to the workmen, while the front was being decorated. Inside Casa Batlló Gaudi re-distributed rooms and added a spectacular viewing gallery. The new doors in the building were also in the curved style that is Gaudi's trademark. Gaudi found much of his inspiration in the pristine beauty of nature. Note the swirling shell design of the main room's ceiling. Main room and gallery of Casa Batllo. Not many building porteros in Barcelona had an office like this. Casa Batllo tickets. Skip the lines tickets to Gaudi's famous modernist masterpiece. 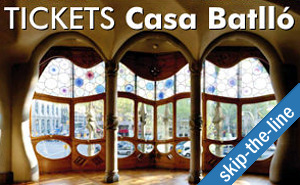 Visit Casa Batlló building which is a legendary icon of art, architecture and art nouveau. Here, light, colour and shapes interact with wood, glass, ceramics and stone in Gaudí’s characteristic fantastic and breathtaking style. Skip-the-line tickets include 1 hour cultural tour and audio guide. You have access to mezzanine floor where Batlló family lived, the attic storerooms and laundry rooms, the rooftop with iconic chimneys, the magnificent hall and main staircase. Lampposts on Plaza Reial in Gothic area.